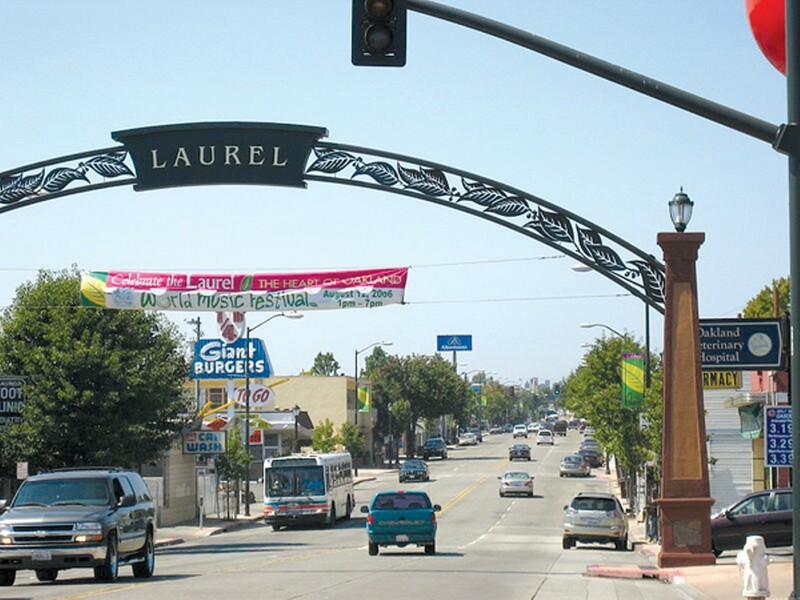 The Laurel neighborhood features some of the city's great businesses. Running north to south, Oakland's Glenview, Dimond, and Laurel neighborhoods, just off I-580, offer some of the best shopping and dining in the East Bay. Plus these commercial districts, which often get overlooked by visitors as well as longtime Oakland residents, offer plenty of fun things to do. In recent years Glenview has undergone something of a restaurant renaissance. Its newest addition is Rumbo al Sur (4239 Park Blvd., 510-479-1208, RumboalSur Restaurant.com). Opened in November by Jack Knowles, owner of the critically acclaimed À Côté in Rockridge, the upscale pan-Latin eatery features the artistry of longtime À Côté chef Matt Colgan. Judging from the hour-long waits on some nights, Rumbo al Sur may be one of the city's hottest new restaurants. It joins other eateries that opened in Glenview over the last several years, turning the once sleepy Park Boulevard neighborhood into a destination. They include Marzano (4214 Park Blvd., 510-531-4500, MarzanoRestaurant.com), Bellanico (4238 Park Blvd., 510-336-1180, Bellanico.net), and Blackberry Bistro (4240 Park Blvd., 510-336-1088, TheBlackberryBistro.com). At first blush, the newest addition to the Dimond district, Organic Bliss (3463 Champion St., 510-482-1742, Organic-Bliss-DaySpa.com), sounds like it might be a new restaurant, too, but it's actually an eco-friendly day spa, specializing in natural and organic skin care. Fellow newcomer Bells & Whistles (2011 MacArthur Blvd., 510-482-4633, BellsandWhistlesOakland.com) offers locally produced home decor. The Dimond, a neighborhood surrounding the intersection of MacArthur Boulevard and Fruitvale Avenue, is known for being the home of one of the best supermarkets in the city — Farmer Joe's Marketplace. It also has a great public library branch and features several eateries that have opened over the past few years: Nama Japanese Cuisine (3400 Fruitvale Ave., 510-530-8564, NamaDimond.blogspot.com), Shaan Indian Cuisine (3434 Fruitvale Ave., 510-531-1172, ShaanIndianCuisine Oakland.com), and La Farine (3411 Fruitvale Ave., 510-531-7750, LaFarine.com), also found on College Avenue in Oakland and Solano Avenue in Berkeley. Last year, the Express named the Laurel the Best Completely Reimagined Neighborhood in the East Bay. Along with the original Farmer Joe's, the Laurel — one exit down 580 from the Dimond (and two from Glenview) — features one of the best independent bookstores in the city, Laurel Bookstore; a great coffee house, World Ground; and a terrific neighborhood hardware store, Laurel Ace Hardware. Notable changes in the district over the past few years include the relocation of Kids 'N Dance studio and theater (3840 MacArthur Blvd., Oakland, 531-4400, KidsNDance.com), which moved across the street to a much larger spot. The additional square footage means that Kris Mueller's beloved dance studio for kids now has a theater, an upstairs level, and a playground. Miracle Toes Dance Studio of the Arts (3825 MacArthur Blvd., 510-482-8637, MiracleToesDance.com) moved into Kids 'N Dance's old spot, offering dance instruction for adults. And a few doors down, Cambodian restaurant Phnom Penh House (3912 MacArthur Blvd., 510-482-8989, PhnomPenhHouse.com) reopened under new ownership after closing down for a short period.